Heat oven to 350 degrees and adjust rack to middle position. Spray a 2-1/2 quart soufflé dish with olive oil spray (or four 20-ounce soufflé dishes), then dust with flaxseed meal, dumping out any extra. Combine parmesan, almond flour, and spices in a bowl. Melt butter in small saucepan over medium heat. Whisk in the dry ingredients and cook, whisking, for about 1 minute. Slowly whisk in milk and bring to simmer. Cook, whisking constantly, until mixture is thickened and smooth. Remove pan from heat and whisk in Kerrygold cheddar until melted and smooth. Let cool for 10 minutes, then whisk in egg yolks and chives. Using stand mixer fitted with a whisk, whip egg whites and cream of tartar on medium-low speed until foamy. Increase speed to medium-high and whip until very stiff peaks form. Add the cheese mixture and fold in, using a rubber spatula, until fully combined. Pour mixture into prepared dish. Run your thumb around the inside rim of the dish to open a less-than 1/4″ channel, which will allow the soufflé mixture to rise cleanly and evenly during cooking. Bake until the soufflé rises above rim, top is deep golden brown, and interior registers 170 degrees, 30 to 35 minutes. Sprinkle with remaining chives and serve immediately. This makes a lovely light supper with a green salad. Once the baked soufflé is completely cool, cover in cling wrap and freeze. To bake a second time, defrost completely by leaving the soufflé refrigerated overnight. Place the soufflé on a gratin or pie dish, pour 2-3 tablespoons of heavy cream over the top, scatter 1 tablespoon of grated Parmesan, and a pinch of salt and pepper. 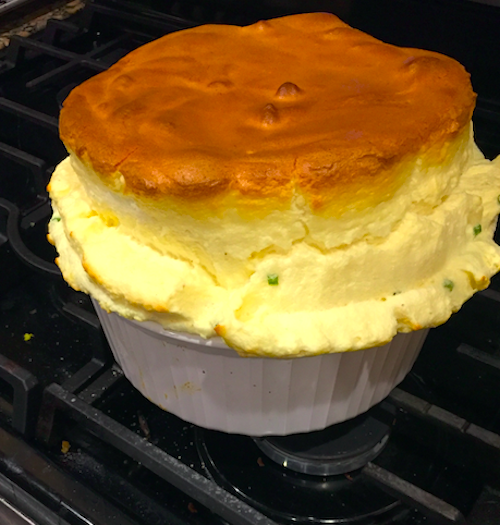 Bake for 15 minutes until soufflé has puffed up and the cream is bubbly and golden. This entry was posted in Eggs, Dairy, Low Carb on March 22, 2019 by Blackberry Season.